Bottom of Squat, 1-2 min. Notes: Advanced athletes should perform these squats at 85-95% for all sets. Newer athletes should perform 2 reps per round. The standard for the L-sit is perfectly locked out knees with pointy toes. It is ok to allow the feet to be at a downward angle. If you cannot hold this position for at least 10 seconds, perform a seated Leg raise for as long as possible. Try not to lean back if possible, but no matter what keep those legs locked out! For the Squats, prioritize an upright torso and quality depth. Scale to back squats and/or use a box as needed and be sure to add in mobility drills in your warmup, cool down and active recovery days to improve this! Notes: Prescribed is 24”/20” and 95/65. New athletes and those with mobility issues should perform ring rows if needed. This should be a sprint! 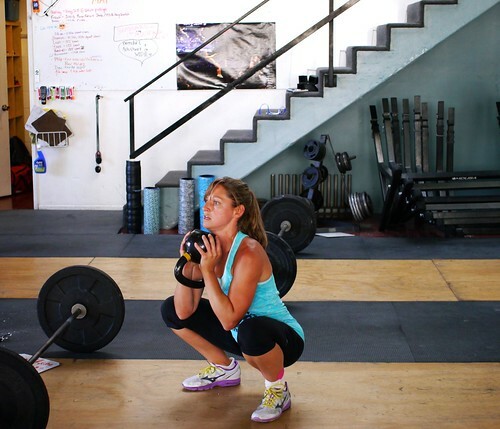 Notes: More Kettlebells! Try to scale the reps over an easier variation or less weight.